If you offered me a list of potential rides for a long-weekend getaway (non-outdoors division), and a full-size 4-wheel-drive diesel pickup were on it, that wouldn’t be my first choice. But if it’s the only choice, and the truck in question is a Nissan Titan XD King Cab, well, you or I could do worse for leisure-time transportation. The $2530 SV Comfort & Convenience Package adds many niceties, including running boards, front and rear parking sensors, blind-spot monitor with rear cross-traffic alert, a power sliding rear window, and a painted rear bumper. 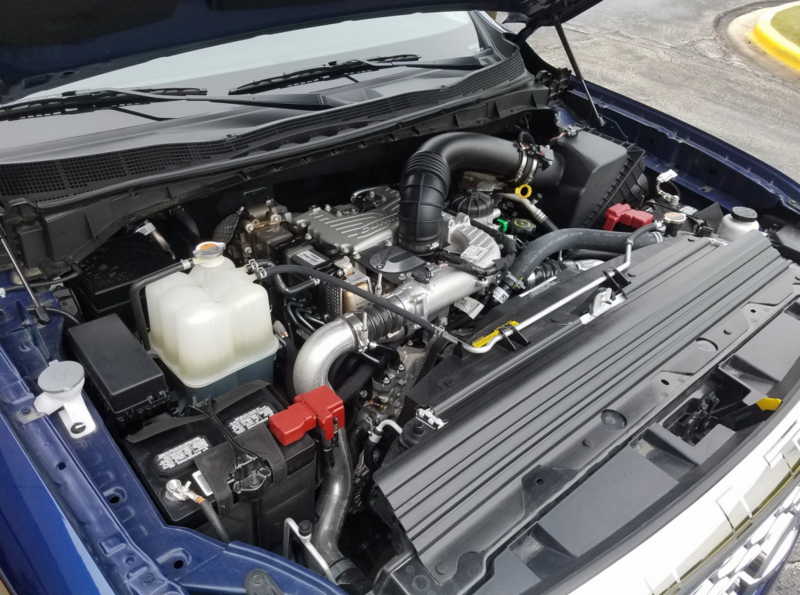 The 2017 Titan XD with the 5.0-liter Cummins turbodiesel V8 is a strong long-distance runner that’s surprisingly quiet at highway speeds. The extended King Cab provides good room for two—and their stuff—and the SV version has a nice level of standard features, with more comforts and conveniences available as stand-alone or package options. The Titan XD’s front seats are comfortable and more than spacious for most any occupant, but legroom is cramped in the rear seat, and the rear seat backs are thinly padded and uncomfortably upright for some passengers. 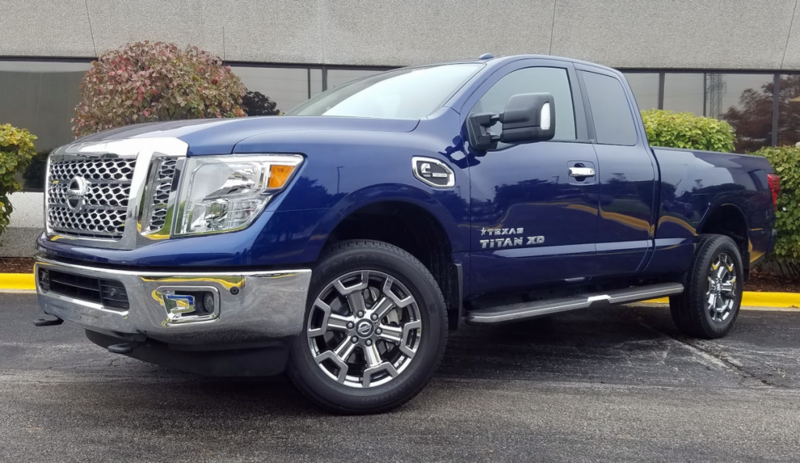 The motivation to “go long” in a Titan XD arose from an invitation to a Nissan media event that had participants drive one from their home to Nashville, Tennessee. (Nissan has a big presence in the Volunteer State, including its U.S. headquarters located in Franklin.) Starting from Chicago, as I did, the round trip was more than 900 miles. The overwhelming majority of that distance was covered on Interstate highways with posted speed limits as high as 70 mph. 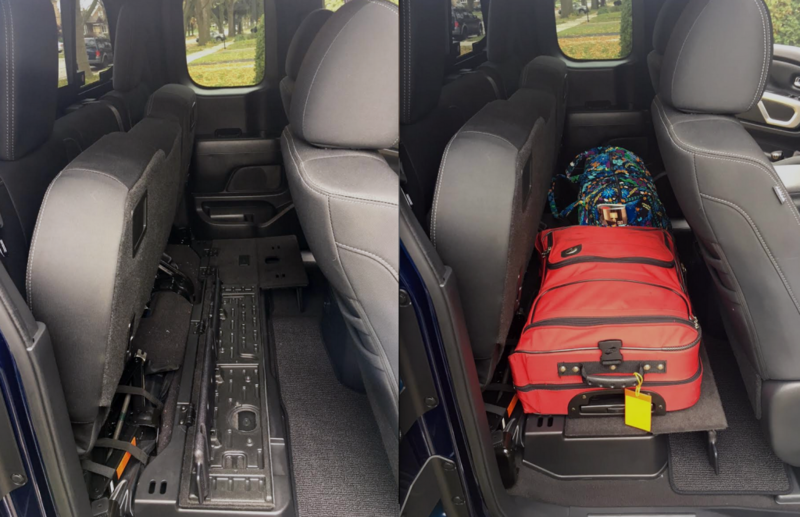 When equipped with the $1120 SV Utility Package, the Titan XD King Cab offers some handy storage solutions underneath the flip-up rear-seat cushions. The fold-out floor panels make a great perch for a weekend’s luggage. The King Cab, with short rear-hinged rear doors that open 172 degrees for easier tight-quarters access to the back seat, is one of three configurations for the ½-ton Titan and “heavy ½-ton” XD. (The others are a conventional 2-door cab and the full 4-door Crew Cab.) Availability of the King Cab is limited to the S, SV, and PRO-4X trim levels. Standard equipment in 4×4 SVs like the one that I drove include cloth-upholstered seats; a carpeted floor; remote keyless entry and push-button starting; 6-speaker audio system with CD and satellite radio; NissanConnect infotainment system; trailer sway control; a trailer-brake controller; shift-on-the-fly 4-wheel drive with a 2-speed transfer case; chrome bumper, door-handle, and grille trim; heated extendable tow mirrors with puddle lamps; integrated gooseneck and Class IV receiver hitches; front tow hooks; and a removable locking tailgate. A spray-in bedliner and 120-volt outlet are also included in the SV Utility Package. Base price for the test truck was $46,540, but delivery and a trio of option packages pushed the final figure to $52,635. A Texas Titan décor group added 20-inch alloy wheels (in place of standard 17s) and other chrome highlights. The SV Utility Package contributed a spray-on liner and lighting for the 6.5-foot cargo bed, plus an under-seat storage floor. Highlights of the extensive SV Comfort & Convenience Package were heated front captains seats, center console, leather-wrapped steering wheel, running boards, automatic dual-zone climate control, navigation, 7-inch color dash display (in place of the base 5-inch screen), rearview camera, blind-spot warning, and rear cross-traffic alert. The Titan XD’s Cummins 5.0-liter turbodiesel V8 engine puts out 310 horsepower and a healthy 555 pound-feet of torque. XDs come with the choice of a 390-horsepower 5.6-liter gas V8 or the Cummins diesel. The latter employs a two-stage turbocharger to reduce lag. 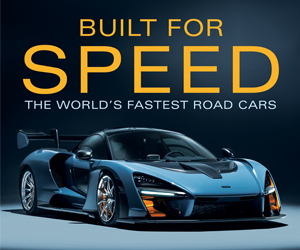 It produces 310 horsepower at 3200 rpm and 555 lb-ft of torque at 1600 rpm. The transmission is a 6-speed column-shifted automatic with a tow/haul mode. This powerteam lets a King Cab Titan XD tow as much as 12,510 pounds depending on the drive configuration. The Tennessee excursion wasn’t Consumer Guide®’s first exposure to the diesel XD. In 2016, CG editors sampled a top-line Platinum Reserve Crew Cab. However, the driving experiences were completely different. That first test covered 349 total miles, 70 percent in city-type driving. This latest run totaled 1054 miles with 89 percent highway operation. The diesel springs to life with the unmistakable clatter peculiar to “oil burners,” and you’d probably go batty (and maybe a bit deaf) if you had to listen to that for hours on the open road. However, the XD diesel’s distinctive sound fades at cruising speed, making it possible to enjoy the radio or carry on a conversation as easily as in most gas-engine trucks. Quick applications of the throttle are met with a bit of a jolt in the driveline, but more measured acceleration, like when pulling out to pass on the highway, is carried out fairly smoothly. In places where the route got a little hillier, there was enough of a steady flow of power to keep the transmission from wanting to hunt for different gears. In the course of six days with the truck, all in rear-wheel-drive mode, it took three fuel fills and averaged 18.9 mpg overall, with a best single stint of 20.1 mpg. (CG’s 2016 XD diesel test produced 15.4 mpg.) Based on computed remaining ranges that the vehicle reported at each fill-up, 440 to 480 miles on a 26-gallon load of fuel was possible. 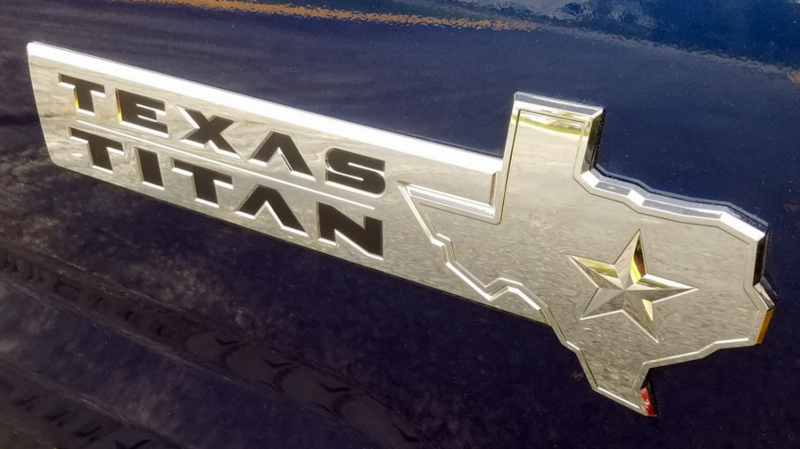 The Texas Titan Edition appearance package includes 20-inch chrome wheels, chrome grille and exhaust finisher, and this hard-to-miss tailgate badge. The Titan XD has a solid rear axle and parallel leaf springs. It can feel somewhat jittery on anything but glass-smooth pavement. Without a load in back, you’ll experience a bit of a hop when hitting a good road bump. Ride height is raised enough for a commanding view of the road ahead, but seeing traffic to the sides can be less clear. Take it from me: You’ll want to get well acquainted with the blind-spot warning and the fisheye portion of the side mirrors before making lane changes. While there is a rear seat in the King Cab (it can be deleted for a $500 credit), it doesn’t have sufficient legroom for realistic adult transportation. You’d need a Crew Cab for that. However, with the seat cushion flipped up and the optional foldout floor platform deployed, there was ideal accommodation for a couple of pieces of luggage for the Nashville weekend. Front seats were comfortable enough to ward off leg and back stiffness, even after three or four hours at a stretch. The official test spouse reported that the headrest was angled just right for her long-term comfort, and at 5-foot-2, she found the running boards exceptionally helpful for entry and exit. 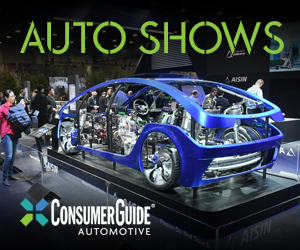 Road-trippers will find the navigation system fairly easy to program. Front doors have long pockets, each with two slots for bottles, and the optional console adds a big covered box, plus a large open bay with room for a fixture with a pair of cup holders. 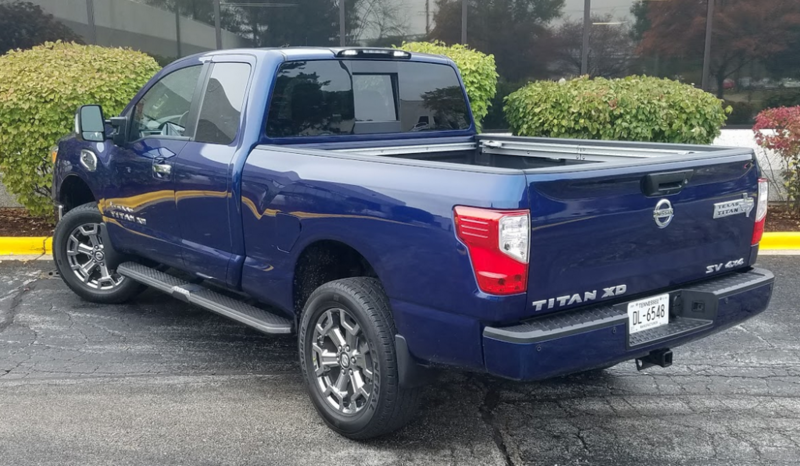 A big pickup like the Titan XD may not be most people’s first choice for a “fun vehicle” in which to hit the open road, especially with a work-oriented diesel V8 under the hood. But if it’s the only choice, it can hold up its end of the bargain. Nissan’s “heavy half-ton” Titan XD lineup occupies the middle ground between half-ton pickups and 3/4-ton trucks, offering towing and hauling capabilities beyond the typical half-ton without stepping to a full heavy-duty truck. Written by: The Daily Drive staff on November 16, 2017.